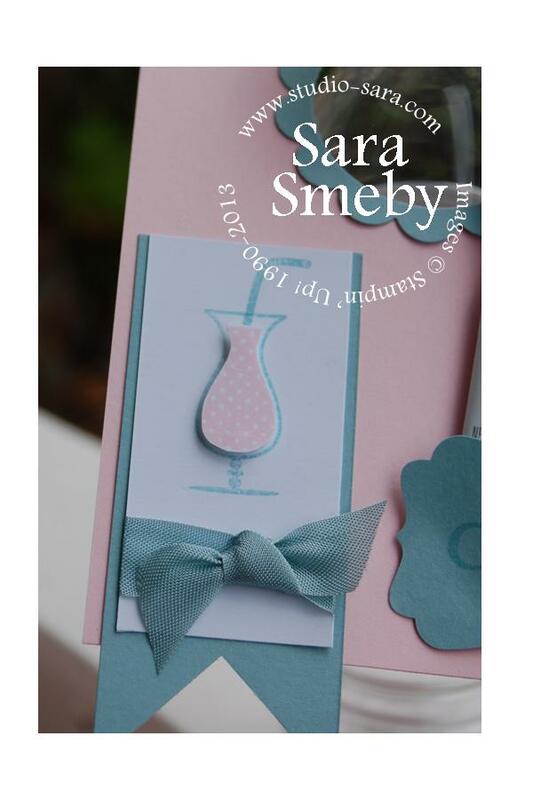 The body of the card was made with Pink Pirouette. The other color is Baja Breeze. These are the colors featured this week in the Dynamic Duos Challenge #11. This card is also based upon the sketch for the 365 Cards Super Sketchy Sunday challenge. I stamped the glass and straw in Baja Breeze and then stamped the contents of the glass a second time on another piece of Whisper White (this time in Pink Pirouette), used my Paper Snips to cut it out and mounted it with Stampin' Dimensionals to make it pop. The flagged ends of the Baja Breeze piece were achieved with a square punch (click *here* for a post including a quick video tutorial). I also punched a circle of Baja Breeze with my 2 3/8-inch Scallop Circle punch to jazz up the spot where the neck of the water bottle is... I punched a 1 3/4-inch Circle through the Pink Pirouette piece, placed the scalloped circle over it and punched again from behind (wasn't sure I'd have the hand-strength to punch two layers of card stock). 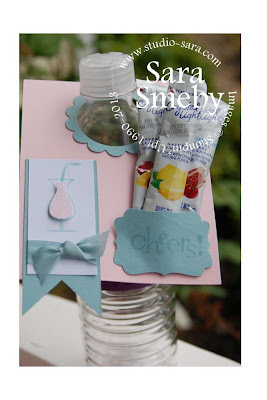 The drink pouches were placed in a "pocket" made from a Decorative Label punch, popped up with Stampin' Dimensionals. What am amazing and creative idea!! 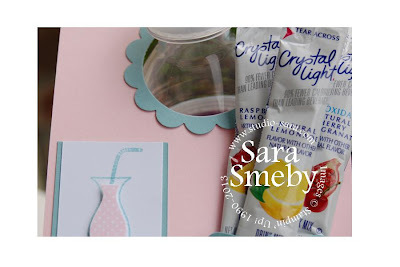 Into my inspiration files! So glad to see you at Dynamic Duos! What a cute idea! Love the little pocket for the drink mixes! Your friend will appreciate this so much! Best wishes to her!